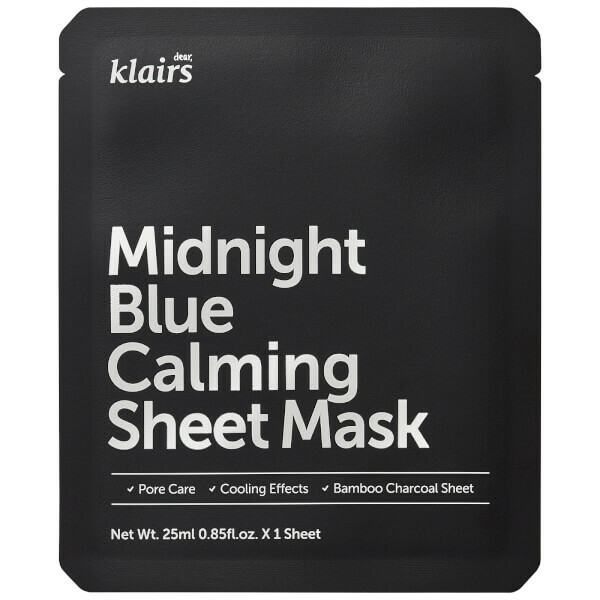 Soothe irritated skin with the Dear, Klairs Midnight Blue Calming Sheet Mask, a soft rayon face mask infused with a host of beneficial ingredients to leave skin feeling clean and cooled. Delivering anti-inflammatory and cooling properties, the refreshing and comforting sheet mask adheres comfortably like a second skin to continuously transport ingredients into skin for maximum efficacy. 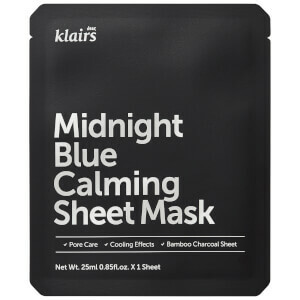 Specially designed to calm the complexion, the sheet mask uses ingredients to decrease sensitivity, including Erythritol, and works to lower skin's temperature to help reduce signs of irritation. Also contains Bamboo Charcoal Powder for pore cleansing and to help prevent blackheads. Suitable for all skin types, especially those easily heated due to irritated. After cleansing, place the sheet on clean/toned face. Wait 15-20 minutes, and gently remove the mask. Tap the essence lightly for it to fully absorb.